It was one of those summer nights that come along in your mind during winter. The humidity was palpable but not too high. The sun was low in the sky, a summer evening winding slowly down into night as if the day is unwilling to relent. Changing like a kaleidoscope from bright blue to bright pinkish-orange, the sky was littered with beautiful cumulous clouds. Jack wanted to catch fireflies that night. His bath was already taken, little brother Luke already in bed, and at least an hour yet to go before the first firefly would emerge from his home. His sandals on his feet, bughouse in tow, Jack took my hand and asked to walk down to the park. The answer was, of course, “Yes.” The summer air overtook us quickly as we departed from the coolness of the house. We took a hard right out the front door and headed down the path toward the little park at the end of the road. Jack grabbed my hand in the way only a three-year-old little boy can—fully, unashamedly, and joyfully. Soon he and I were off into the great wide open to hunt for his beloved fireflies. I realized quickly that my large, adult steps where causing his little legs to work extra hard, but he wasn’t complaining. This was the kind of night he dreamed of; a night with just he and Daddy, walking together to hunt down something magically. It was the kind of night I dreamed of, too. The walk to the park was slow. It was happy. It was heart filling. Life doesn’t allow for these kinds of moments often. It’s the stillness of the summer evening and the leniency of a mother and father and the child-like excitement of a little boy that can only create these kinds of night. We have them from time to time, but only rarely. Life is more demanding of us than we ever thought it would be. None of us can escape it. The hurts and pains and failed attempts and lost dreams mixed with the chasing of new dreams and plans of the future create a sort of angst inside of us that does it’s best to push these kinds of nights out of our realm of possibility. But in the grace of God a moment will come along surprising us in its innocence and peacefulness. We’ll wonder why we don’t do this more often and we’ll plan to do it again as soon as possible only to find that these moments that we cherish in life aren’t so much created as they are received. From the hand of God himself these moments come down to us from heaven to remind us that our Father cares for us. As I was taking Jack’s hand and leading him down to the park, God was taking my hand and leading me into his joy. We reached the park in due time. It wasn’t a quick trip. It was deliberately slow. We passed the creek on our left and Jack exclaimed, “Dada, I see creek!” I looked over at it with him and asked if he wanted to go down and sit by it. His answer, as always, was no. He’s not a fan of water, especially the kind that moves somewhere. So we continued down our path. A few steps away from the creek Jack let go of my hand. I looked down as he was bending low to pick up a small stick. He promptly put it in his bughouse, a nice perch for his soon to be firefly friends. He reached back up, taking hold of my hand. My heart filled again. Something in the way he looked at me as he told me about that stick filled me anew with child-likeness. He was thrilled to have found such an amazing thing just lying on the path. What joy must we miss as we rush from appointment to appointment? Jack notices everything. Sometimes I wonder if I notice anything. He not only notices but also enjoys that which he sees. He takes it in like we do when trying a new food. He lets it roll around in his mind. He evaluates it and then proclaims it good or bad. Everything he sees gets a fair shake. Nothing is left without a pronouncement of good or bad, in the way only Jack could say. Our path had finally run out and we turned the bend to enter the park. It was unusually crowded this night, though not with friends his age. There were two kids playing soccer with their dad, a group of teenagers coming up from the creek bed where they had no doubt spent a good amount of time relishing in the cool water on the hot summer evening. There were people riding bikes and running on the path. It was full of life. It representing what was happening in Jack’s and my life. We were full of life. As silly as it seems in the grand scheme of life, we were deeply excited about catching fireflies. We had made it to the park but we were still woefully early for the fireflies. We would have to spend the remaining minutes swinging and climbing and sliding down slides. At any other time it would have been thrilling, but tonight it was just something to pass the time. Oh, there was joy in it enough. Fun was had. But it was not our objective. We had bigger plans than a baby swing would allow for! “Jack, do you want to walk back home and eat an ice cream bar while we wait?” I asked him as he swung through the air, legs flailing all about, twisting his swing. “Oh, yeah!” Jack replied. So we walked back home, hand in hand, stopping only to pick up some rocks or a few new sticks. We walked slowly back; I wasn’t willing to rush through this. My heart, though I barely noticed it at the time, deeply needed these moments with my young son. I was building a memory for him. I was building a memory for myself. What was happening that night was ours. No one could take it. We would remember it, me more than him, but whether he realizes it or not these kinds of moments are what makes me his daddy and he my son. Walking by the side of the house we heard a tapping on the window. It was Mama! With a smiling face she was waving us home. Luke has just been put to bed. Jack and I entered the house to proclamations of, “Mama, eat ice cream bar!” in Jack’s youthful voice. All shared the excitement. Ice cream bar in hand, we settled on the back deck, eyes peeled for the lights to shine in the darkening sky. Ice cream bars never last long enough. They were soon completely gone, enjoyed down to the last bite. Still with no fireflies in sight, Jack and I set out to the garage to play with toys until the night grew closer. Finally, moments later, our time had arrived. Jack was the first to spot them. “Dada! Dada! Stop! I see firebug!” Fireflies never had a cuter name. We ran to get the bughouse we had left on the back deck. Running as quickly as we could around the front of the house, Jack was yet again the first to see them. “Dada, over there! I see one!” I rushed over and grabbed it. Jack came running, laughing and jumping. We put it in his bughouse and our hunt began. It lasted only about 15 minutes. But for 15 minutes we were two of the greatest firefly hunters Middle Tennessee had even known. 20 fireflies and one crowded bughouse later, we surveyed the land can concluded that we had caused extinction in the front yard. As we stood there, looking for just one more, I looked down to see Jack aping my stance. He was happy in that moment. I could tell only because of how he was trying to be like me. My heart filled once again. I had just had fun, f-u-n, untarnished, child-like, carefree fun. After a few pictures and admirations we decided to open the bughouse door and release the fireflies back to their homes. One by one they flew away to the “Bye bye” of their greatest hunter, Jack Briggs McLemore. They would meet again, but for now the game was over. And so ended another summer night. It was like any other summer night, except it wasn’t. In nearly every place on earth the evening of July 21, 2014 was as normal as July 20, 2014 and July 22, 2014. But for the McLemore men of the McLemore household, it was a night to remember. We had waited, we had trapped, we had enjoyed, and we had released the essence of small boyhood fun. Our night was ending but the memory was just coming off the presses, to be read about the next day and kept in the scrapbook of the mind for years to come. 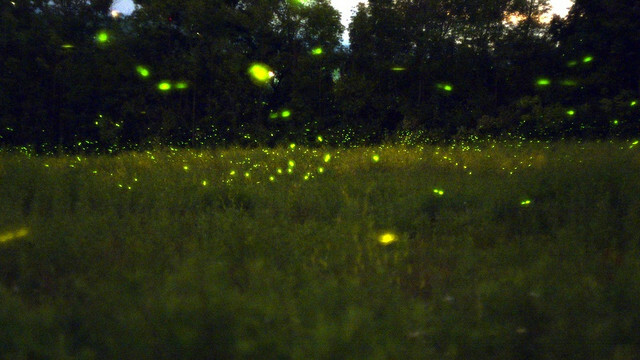 As we entered the house, the front yard lit up once again with the majesty of the fireflies. A boy had a smile on his face and sweat on his brow. His father had the same. We climbed the stairs for bed and as I lay with him there that night, waiting for him to go to sleep, I thanked God for what he had just given me and realized that soon—sooner than I can even imagine—I will be doing the same thing with my Father in heaven. He will one day take my hand and lead me on the adventure of discovering his world, of discovering himself, and I will forever be satisfied, just like tonight.